Not only did the famed Seminole war leader lead his forces against the U.S. Army near the barricaded village of Micanopy, Florida (Ft. Defiance) in 1836, but Zachary Taylor, future president, once led the Army of the South while at Ft. Micanopy. Governors, generals and some of the Seminole's greatest warriors clashed here during the 2nd Seminole War (1835-1842). And more soldiers died in combat while stationed at Micanopy than in any other Florida garrison. Turns out that Micanopy, one of the state's smallest towns, is actually very big in history. 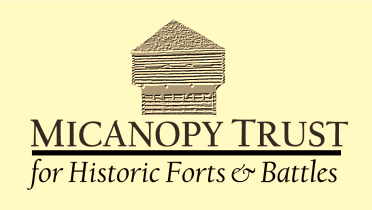 The Micanopy Trust for Historic Forts & Battlefields, Inc (a non-profit corporation), drawing upon new discoveries made by an extensive archaeological investigation funded by the National Park Service, aims to protect, preserve and promote the 2nd Seminole War sites in Micanopy -- the 1st territorial town in Florida. These rare historic resources have previously been lost to local oral and written history. Historical markers, educational kiosks, and eventually a museum are planned to advance these goals. The Trust also intends to place these combined sites as a National Historic Landmark. in the Alachua County area and to acknowledge the contributions of the Army, the Seminoles & their black warriors. We also aim to pro-mote friendship and cooperation with the Seminole Tribe of Florida. ​ The battle took place on the morning of June 9, 1836. Seventy-five troops under the command of Major J. F. Heileman engaged a larger Seminole force headed by Osceola, numbering about 250 warriors. Two units--one mounted, the other foot artillery--departed Fort Defiance (the fortified village of Micanopy) to meet the Seminoles. In a classic pincer movement, troops engaged Osceola’s left and right flanks while an artillery unit deployed a cannon at the center. The battle also featured a surprise attack on the Seminole’s rear flank. After one hour and twenty minutes, the Seminole retreated. The Army suffered one death and several wounded while Native American losses are unknown. Heileman was brevetted to Lt. Colonel by order of President Andrew Jackson, but died of malaria shortly thereafter. Following the withdrawal of most of General Winfield Scott’s “grand army” of 5,000 troops one month prior to the battle, all garrisons in the East Florida interior were suddenly vulnerable to attack. 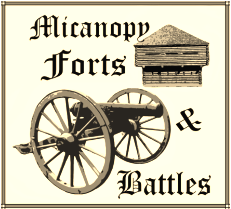 The victory at Micanopy thus served to rally the troops in the face of significant hardships, which also included a virulent malaria epidemic. Although this feat proved short lived, the engagement did indeed mark the first time during the campaign when the Army—notably without the presence of imperious generals—truly met the country’s expectations of heroism under fire. 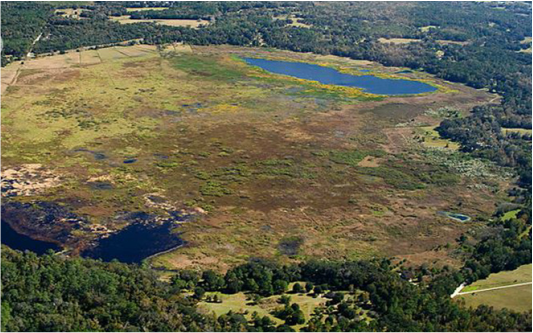 Aerial view of Tuscawilla Prairie, the site of the Battle of Micanopy (1836).